It is rare that a book categorized as a romance captures the attention of and entertains both men and women. Author Kameron Scott does just that with his new book, Forgotten Love. Scott describes his book as “part Jurassic Park, part The Mummy, and part Romancing the Stone,” and it lives up to that description, keeping readers engrossed in its story from cover to cover. Scott’s characters, Theo and Gillian, live in a world of “ancient mysteries and forgotten wonders.” Readers are given a front-row seat to watch their adventures unfold in surprising and amazing ways. It may be a fantastic story, but it is based on real-life events. In July of 2012, there were a few days during the course of which 97 percent of Greenland’s ice sheet indicated surface melting. Intrigued by what he considered and “unbelievable” and “shocking” occurrence that seemed as though “it might have been carved out of the make-believe world of an adventure story,” Scott questioned, “What mysteries could be discovered there by two intrepid minds, if they went searching?” Theo and Gillian’s story was born. Readers will, inevitably, be left anxiously awaiting the next two installments in the ‘Forgotten Chronicles’ series, Forgotten Past and Forgotten Time. Kameron Scott is a San Francisco native. Scott is a former internet technology executive with over 12 years of experience building, managing, and scaling development teams. He is currently living in Santa Barbara, California, where he is completing work on the next two books in the ‘Forgotten Chronicles’ series, Forgotten Past and Forgotten Time. Recent headlines have been nothing short of dismal. Itis nearly impossible to find much that is positive in life. Americans are increasingly becoming more and more concerned about the lack of moral values and the lack of positive influences in the world. Karl Allen has done his part to remedy this by offering his philosophies of the positive understandings that ís missing. The Golden Virtues of Jesus Christ by Karl Allen is far more than a typical self-help book.Using an extensive and well-explained list of 120 virtues, Allen shows the reader how he or she can lead a better life in a world that is full of immoral influences. The list is composed in such a way that the reader can determine which virtues they need to work on improving. Allen writes about justness, fairness, tenderness, thoughtfulness, courtesy, honesty, kindness, gentleness, and many more virtues that any person can benefit from by incorporating them into their own life. At the very beginning of the book, Allen urges, "We have the potential for positive and negative behaviors in us; to both enhance each other's lives as humans, and to do each other harm. Virtues are the moral qualities we have predisposed within us to do each other good." lt is a powerful reminder that we all have good in us but the world has been practicing terrible evils. Through Allen's words, readers will be able to find and enhance their morality. Today's world has negative influences at every turn: at school, at work, at home. There are good things in life, but they can often be hard to focus on. With these negative influences pressing on us, it can be difficult to lead a positive and virtuous lifestyle. The Golden Virtues of Jesus Christ arms readers with the tools they need to go against these negative and harmful powers in the world. ln a society in which morals are difficult to admire, if not impossible, to detect, The Golden Virtues of Jesus Christ is a much» needed breath of fresh air and inspiration. Karl Allen is a senior Psychology major with minors in Sociology and Philosophy. ln addition, he is also an un-ordained minister who has read the Bible from cover to cover, and is eager to help others improve their lives through its teachings. 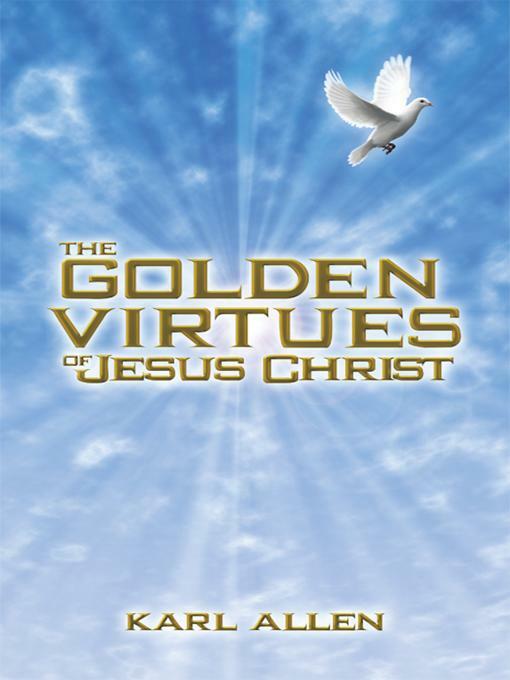 The Golden Virtues ofJesus Christ is a book on learning to live a virtuous life, on why one would want to, and on the benefits society reaps when We do so. He takes a look at some basic attributes of life, such as the desire to retaliate, the conditions of our lives, whether we have suffered misuse or abuse, our personal sensitivity levels, our pride, and more. He then explains hovv these attributes or states of being affect our desire to achieve and maintain virtuous behavior. He lists and explains some techniques for becoming virtuous, i.e., self-monitoring, self-observation, good feelings, will power, benevolence,practice among others. Alien explains the purpose of living the virtuous life. He telis us that virtues are how we "show courtesy" to each other as human beings. He points out that when there is an "absence of virtues, the world is in a state of turmoil and degeneration." Next, Allen lists 120 Virtues which he first defines and then goes on to explain the need for adhering to the virtue in our lives. He tackles things like tactfulness, assertiveness, strong mindedness, wit, manners, expressiveness, kindness, sincerity, and other virtues, or qualities of behavior that serve to make us a better person. He states that virtues are "the positive effectual energies that we express in our speech, attitudes and deeds, that bring about the desirable events and experiences of life." The book is written in a simple, easy-to-digest style, and in small, bite-sized chapters that are just right for evening contemplation or morning meditations. Try it, you`ll like it! Award-winning R&B artist Bobby Tinsley drops his new album, Love Past…Love Present, just in time for the most romantic holiday of the year. With his smooth, electric voice and intense, soulful lyrics, Bobby Tinsley sets the mood for listeners. From the first notes of upbeat and excited “Stop the World”, which opens the album, Tinsley fans know they’re in for something good. Moving on to slower, more romantic R&B ballads like “Under the Moonlight” and “Where’s My Heart”, Tinsley brings up the more complicated aspects of love, giving listeners something they can relate to, no matter their mood. Calling up classic R&B sounds, beats, and themes, Tinsley seems to be channeling some of the greats on his newest albums, making it easy for listeners of all ages to enjoy. “Magical” is certain to take listeners back in time through the highlights of R&B pop, and Tinsley’s intriguing voice soars from a deep, emotive speaker to a higher, smooth sound when he sings, laying his feelings bare for listeners. Additionally, Bobby’s latest project reaches out to his fans in an unprecedented way: he plans to blog about one song from the new album each week, going in depth about its meaning to both himself and fans worldwide. The themes of love, what it is and what it is not, where it’s been and where it may end up, are woven throughout the album, making Tinsley stand out among the young artists of today, cementing him a place in the upper echelon of R&B artists. Bobby Tinsley is an amazing artist who entered the music world in 2004 with his self-produced album of all original songs, "Page 1”. He has received thousands of letters, comments and messages from young and old, male and female alike, who are anxiously awaiting the release of his new project. He has some of the most loyal fans in the world who adore his music, to the extent that they have made more than 850 different YouTube videos with their own versions of his songs. The total plays of these videos – driven completely by his fans - are more than 10 million. The elusive and mysterious “Holy Ghost Writer”, an author whose identity has yet to be revealed, brings another exciting adventure to readers in book eleven of the “Count of Monte Cristo” series, The Boy Who Played with Dark Matter. While readers of the first of Holy Ghost Writer’s books will certainly enjoy this new book, it is equally easy-to-be-enjoyed by new readers, and it is the first to reach a young audience. The Boy Who Played with Dark Matter is the thrilling tale of Zeddy, a 6-year-old boy whose life is about to change in wondrous and exciting ways. After the disappearance of his father, Zeddy sets out to find him, determined to bring him home no matter what. However, Zeddy lives in 2099, and the world is drastically different from what we know now. Zeddy learns that the universe is bigger than he ever imagined, and begins a journey that leads him into the path of bizarre ceratures from another world, powerful sorcerers, and a peculiar professor that may hold the key to finding Zeddy’s father. Standing in Zeddy’s way is a very large and dangerous International government; an organization that just might be blocking Zeddy’s every turn on his quest. The Boy Who Played with Dark Matter is the eleventh book in the phenomenal Count of Monte Cristo series, author Holy Ghost Writer’s intriguing continuation of the famous Alexandre Dumas tale. All of these fascinating books are linked, and The Boy Who Played with Dark Matter will undoubtedly leave readers eager for the next installment of the series, which will forge the connections between books two and six, as well as bring another thrilling adventure to the table. A great read for readers both young and old, The Boy Who Played with Dark Matter is sure to be a hit with any and all readers who enjoy science fiction, adventure, and fantasy. The identity of the mysterious “Holy Ghost Writer” remains a mystery to readers. For those inquisitive readers who want the opportunity to win a $2,500 prize by correctly guessing the identity of “Holy Ghost Writer” before he/ she reveals his/her identity, guesses should be sent to prize@sultanofmontecristo.com. The story of an ordinary young man rising to be a rock icon and live a life that is anything but ordinary is one that is familiar to anyone who has ever followed the lives of their favorite musicians. Along the way, there are usually ego clashes, fights amongst band members, and maybe a little romance. The life of a rock star has all of the elements of a page-turning book. Music fans of all types will enjoy the new book by Monica Daddio, a fellow lifelong music supporter, who took this familiar story and humanized it. In Humanizing the Jaguar: Portrait of a Superstar, she pays tribute to the artists that she loves, and offers a storyline that music fans are certain to appreciate. Her central character, Bryan Wharton overcomes his emotionally scarring past through the love and encouragement of his new family to pursue his dream of rock and roll fame. On the meteoric rise to fame, Bryan’s relationship with his band mates is tested when his attitude threatens to tear them apart. When he meets a young woman who has no idea who he is, Bryan is able to open up to her. Soon, he realizes he needs to devise a way for Donna to be near him for what he believes is his own selfishness. Throughout the book, Daddio offers a game for music enthusiasts, encouraging them to find over 150 clues that are scattered through the text. Whether readers are musical buffs who read to play the game, or they simply love a story that is filled with drama, suspense, and romance, Humanizing the Jaguar has it all. Music fans have something new to add to their collection: Monica Daddio’s must-read. Monica Daddio was born and raised in Trenton, NJ. After working for the Mercer County Elections Office, she retired and relocated to the Bristol Virginia/ Tennessee area. Her passion and love has always been music, and she jokes that she is a professional listener. With a vast collection of over 500 artists, she has a wide range of musical tastes, and that’s how her story came to be. Humanizing the Jaguar is her tribute to the musicians and music she loves so much. For more information, please visit http://humanizingthejaguar.com/. Read Monica Daddio’s blog at http://monicadaddio.com/. How many people dream of one day living ‘under the Tuscan sun’? The area is filled with charm, romance, and culture, making it a popular destination to daydream about. In 2004, Sam Hilt and his wife decided to pursue their dream, leaving to Bay Area and settling into a village in Tuscany. Turning Tuscan tells the story of their “slow-motion migration” to Tuscany, as well as offering an insider’s perspective on what living and working in Tuscany is really like. If you’ve ever wanted to know what it would really feel like to pursue the Tuscan dream and become a part of a village community, Turning Tuscan offers a perspective that is unique. The trick, Hilt says, is capturing that “limited window of time” available to record your insights; “You have to become Italian enough to play the game, but not so Italian yet that it all becomes invisible. If you wait too long, you are no longer in a position to reflect or comment on cultural differences because what people are doing seems totally normal to you.” And life in Tuscany, by American standards, is anything but normal: Hilt describes the challenges of getting an internet connection, understanding the political scene, “appreciating” the bureaucracy, and enduring customer service at the phone company, as well as those magical opportunities, like enjoying Renaissance art and participating in village festas. Hilt’s book is one that will, inevitably, have readers longing to go to Tuscany, despite the cultural quirks. Sam Hilt went back to graduate school to pursue a Ph.D. in the early 90s. He wrote his dissertation on 15th century Florentine art and fell in love with Italy while he was spending his summers in Tuscany doing research. After completing his doctorate, Hilt taught part-time at various colleges and universities in the San Francisco Bay Area. He had the opportunity to organize and teach an alumni summer tour in Tuscany for a Bay Area college. After its success, he began promoting and teaching art seminars in Florence every summer. After a few years, Hilt and his wife decided to turn their summer hobby into a full-time tour business. In 2004 they moved to a little village in Tuscany and have never looked back. Sam Hilt and his wife run Tuscany Tours, a tour company that offers unique lodging, immersion in Italy, and “time to savor the unexpected.” They pride themselves on striking that delicate balance in their tours between history, shopping, art, cuisine, and fun. By limiting their tour size to sixteen travelers, Tuscany Tours is able to offer their guests food and lodging experiences that are not available to large groups. Tuscany Tours is a member of the American Society of Travel Agents. For more information, please visit http://www.tuscanytours.com/. Manou has had a wildly successful career with German pop band beFour. The band sold one million records, including one platinum record and ten golden records, and starred in 160 episodes of their own show on the Disney Channel. Now, three years later, she is launching her career as a solo artist and bringing her music stateside. For all that accomplishment, MANOU came a long way. But she says: That’s only the beginning! American pop fans will quickly discover exactly why Europe fell in love with Manou: her unique music, her crazy stage performances and her extraordinary fashion style. She was an idol in Europe for lots of kids and teenagers. Now Manou is on a one-woman mission together with her band and background dancers to offer a show that makes people happy and puts them in a trance so they forget about all of the troubles in their lives and in the world. Her music is different, too, from the feel-good pop that is out there, not limited to a particular age, but is, instead, ageless: everyone from young to old can identify with the universal themes in her music. Manou co-wrote her new album with the songwriter/ producer Taylor Carroll from Nashville. Together, they created something new that is certain to satisfy her existing fans and win over new fans. In writing her new album, Manou drew on experiences from her own life. True to her freaky nature and desire to spread happiness, there is even a little surprise in the album: Manou stickers. Americans will, undoubtedly, fall in love with Manou, who has long been one of Europe’s sweethearts and idols, and her new music. Manou has sold over one million records. One of her albums has gone platinum and ten times gold in Germany, Switzerland, and Austria. She has received two Echo nominations (the German equivalent of the Grammys). Her debut album, All 4 One, reached #1 on the German and Swiss charts and #2 on the Austrian charts. Manou came to prominence after participating in the most successful European Disney Band, “beFour”, whose concert tours reached over 100 cities yearly in Europe, as well as 168 episodes of their own television show on the Disney Channel. For more information, please visit www.manoumusic.com. Follow Manou on Twitter @ManouOeschger. “Like” Manou on Facebook at https://www.facebook.com/pages/Manou/288297691228108.